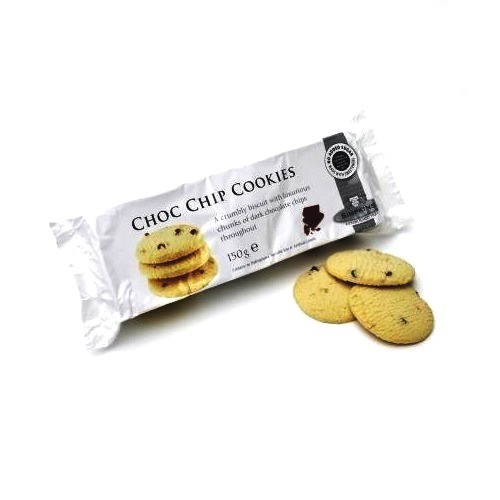 Ingredients: wheat flour, vegetable fat (vegetable oil, water, salt, emulsifier E475, flavouring, colours: annatto, curcumin), sweetener: isomalt, chocolate chips 6% (sweetener: maltitol, cocoa mass, emulsifier soya lecithin, fat reduced cocoa powder, flavouring natural vanilla), rice flour, corn flour, sweetener: acesulfame k, vanilla flavouring. Contains wheat, gluten, milk and soya. May contain traces of nuts.